VANCOUVER - The U.S. government has suspended a 31-year-old agreement that allowed Canadian vessels to fish for tuna in American waters, two British Columbia industry groups confirmed Wednesday, with one warning the decision could have a domino effect across the entire West Coast fishery. Both countries signed a treaty in 1981 that allowed cross-border fishing for albacore tuna, but it expired in 2011. Negotiations to renew the treaty have been overshadowed by concerns from American fishermen, who have complained they were being outfished by Canadians. American negotiators flew to Ottawa last week and surprised Canadian officials by announcing there will be no reciprocal fishery for 2012 while talks for a revised treaty continue, according to the Canadian Highly Migratory Species Foundation and the B.C. Tuna Fishermen's Association. Both groups say they were informed about the decision earlier this week. "We got a phone call Monday from Ottawa saying the U.S. delegation visited and said there would not be an agreement for this year," the foundation's Lorne Clayton told The Canadian Press. "That's the decision that was made by the U.S. delegation, that it's their final decision. Our job in the meantime is to convince them that it's not in their best interests to stop the agreement, so we're still working to change their mind." In the early 1980s, when the treaty was first signed, there was an abundance of tuna near the Queen Charlotte Islands off the northern B.C. coast and it was the Americans who advocated for the agreement, said Gregg Holm, vice-president of the B.C. Tuna Fishermen's Association. Holm acknowledged that in recent years the tuna fishery has been concentrated south of the border. Under the treaty, 110 Canadian vessels had access to American waters and the Department of Fisheries and Oceans estimates about 80 per cent of the Canadian tuna catch has typically been caught within the U.S. economic zone. The department says the Canadian albacore tuna fishery is worth about $30 million a year. 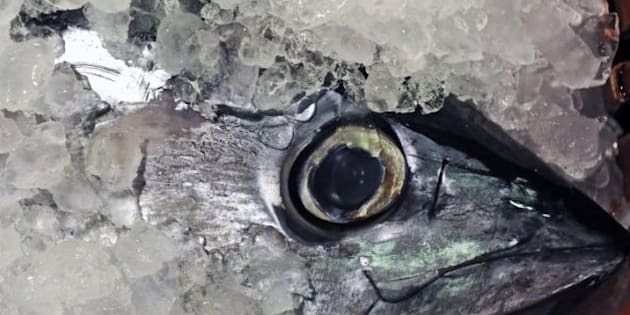 Holm said he expects a revised treaty will be in place for 2013, which he predicted will allow Canadians reduced access to American tuna, but he said the suspension this year will be a major blow to the industry. "A lot of the fishermen have been relying on multiple fisheries to survive," said Holm. "The halibut this year is looking fairly bad for price, and when you take the decline in the salmon fishery and the fact that fuel prices have gone through the roof, this could actually be the start of a domino effect for the entire province. A lot of guys are just hanging on and this fishery is what was keeping them viable." The treaty initially allowed the two countries unlimited access to each other's waters, but changes a decade ago imposed limits on the number of vessels from each country that could cross the border. The current negotiations involve the Canadian Department of Fisheries and Oceans and the Foreign Affairs Department, as well as the American State Department and the National Oceanic and Atmospheric Administration. A Fisheries Department spokesman wouldn't confirm the U.S. decision. In a brief email response, Frank Stanek would only say that the Canadian government is attempting to negotiate a "viable interim solution" until the treaty is formally renewed. An official with the U.S. State Department also declined to confirm the status of the reciprocal fishery for 2012, insisting negotiations are ongoing. The Western Fishboat Owners Association and the American Albacore Fishing Association, both based in California, have complained that Canadian fishing vessels have been catching too many tuna and crowding American waters. Neither could be reached for comment Wednesday. Earlier this month, the Pacific Fishery Management Council, which makes recommendations to the U.S. government to manage fisheries off California, Oregon and Washington state, wrote the National Oceanic and Atmospheric Administration recommending the treaty be put on hold. In a letter dated March 13, the council's executive director, Donald McIsaac, noted an ongoing economic impact study is examining the effect Canadian ships have on U.S. ports, and he said the treaty shouldn't resume until that is complete. "Suspension of reciprocal access in 2012, or longer if necessary, will allow stakeholders and managers to better assess the information and data needed to address the long-term reciprocal privileges under the treaty," wrote McIsaac. "The council notes that the composition of the Canadian fleet, Canada's marketing efforts, and the fleet's fishing methods have changed dramatically over the past 10 years. Such changes have resulted in an increase in Canadian fishing effort in U.S. waters, increased catch per vessel, and crowding on fishing grounds in U.S. waters." Canada has seen other international fishing disputes balloon into full-blown trade wars. The most notable was the so-called turbot war in the mid-1990s, when a Spanish fishing boat was seized off the East Coast for illegally fishing turbot. After the incident, Canada and the European Union struck a deal to manage turbot stocks in international waters. Canada and the U.S. have also had recurring disagreements over the management of the West Coast salmon fishery, with the B.C. government launching a lawsuit in the late 1990s challenging the terms of the Pacific Salmon Treaty. The province dropped the lawsuit in 2000. Holm said he doesn't expect the suspension of the tuna treaty to mark the beginning of another trade war. "No one wants to see this escalate to the point where it strains relations," he said. "It's very unlikely (that U.S. waters will be open to Canadians) this year, but we would still like to see it resume for the upcoming years. The Americans need to keep in mind that this is a migratory species, and it doesn't make sense for them to shut themselves out of the Canadian zone."